“Rarely have so many tourism professionals from all parts of the world contributed to a single, global conversation,” said Isabelle Ducharme (Co-president of the Summit). Accessible tourism is significant in numbers and in the discussion. Brilliant to connect to people that so far, we met online! Great to meet like-minded passionate wheelchair travellers! Destinations for all is organised every two years in different countries. The summit aims to entice the tourism sector to commit to sustainable tourism, provide tools and assistance and highlight the number of visitors to sustainable tourism destinations. In Brussels 400 participants came from 225 different companies, representing 42 countries. 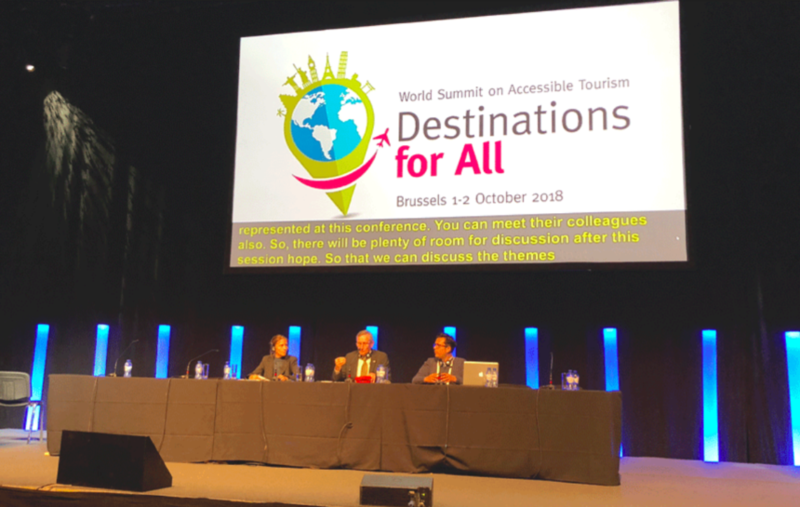 In more than 60 plenary and parallel sessions e latest findings and innovations in accessible tourism knowledge was shared. 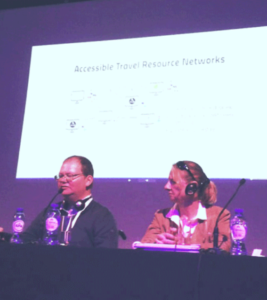 Tobi presented on Monday in the session “information and planning” on the topic of Data discoverability and quality of online information of accessible tourism websites. The challenges for individual websites is always that they do not have much traffic or resources to be ranked on top in google and other search engines. He shared his insights from discoverability in the web and focused on SEO (Search engine optimisation) practices. He concluded that also it is so important to link to other organisations on the webpages but also establish networks outside for support and to increase visibility. 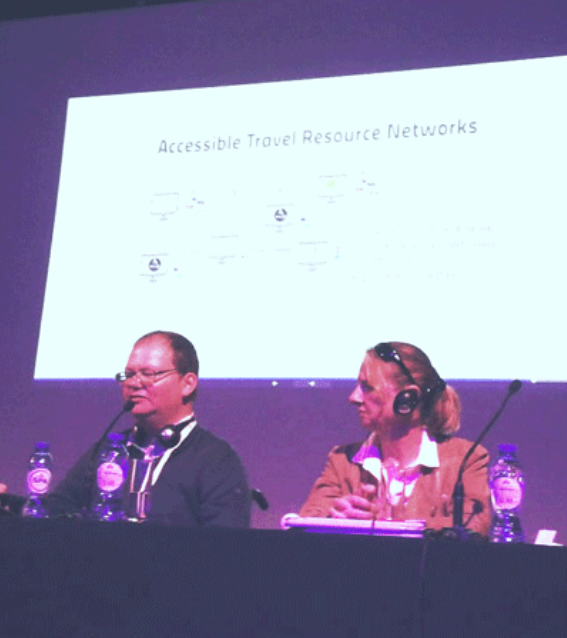 That is when he presented on our current initiative of the Accessible Travel Resource Network. Several people approached Tobi for follow up questions. New possible business development area for Tobi – Huge Success! It was great to meet Martin Heng, accessibility manager at Lonely Planet again. I met Martin the first time in 2016 in Sydney, Australia when he was visiting from Melbourne. We had collaborated to update his Accessible Travel Resource Book which he published at Lonely Planet. Here you can find our interview with him. Thanks to Martin we also connected to Ivor Ambrose, the director from the European Network of Accessible Tourism (ENAT). He is very active and ENAT is an organisation for information, research and networks. He shared his recent experience with the group of Accessible Cities. He supported our network idea and also provided the option to link it up to the ENAT website. Brilliant! We met lots of tour operators and accommodation providers from Peru – Tambo Blanqillo, South Africa, Nepal (Pankaj Pradhananga from Four Season Travel Tours), Canaries (Gran Canarie Holidays) and New Zealand (Making Trax). It was so good to see such a variety of offers and Jezza’s activities are amazing…want to try with Tobi the skydiving soon. We met Pietr onder Meere, which we have met online already, finally in real person. His organisation Toegan ke lijko preis is a dutch platform for accessible travel. Dr. Yasmine Gray has an organisation called Getaboutable.com, which collects accessible accommodation, restaurants and transportation links worldwide. In a talk about blogs and social media John Morris, founder of Wheelchairtravel.org discussed with bloggers, how their projects developed in the last few years. Melanie Borges (Little Miss Turtle) has traveled to many places such as the US and Japan. Aurélie Loaèc (iwheeltravel) is exploring many adventurous activities such as paragliding or balooning. Blandine Evans (Mille découvertes sur 4 roulettes) travelled in her electric wheelchair alone for 12 months! Truly inspiring. So far we have organised three skype meetings since the conference and we have Brussels, Germany, Sulawesi, Bali, Melbourne all in one forum. It is so great to exchange and motivate us to work together on certain issues! The network’s primary focus is to provide a platform for web-based information providers to exchange on experiences, challenges and overall to increase our visibility. Besides a monthly skype call, we are planning to set up an internal Facebook group to share content for our websites and social media platforms. We also contribute to the Lonely Planet global resource book for accessibility and might also engage to bring the Destinations for All Conference 2020 or 2022 to Asia! 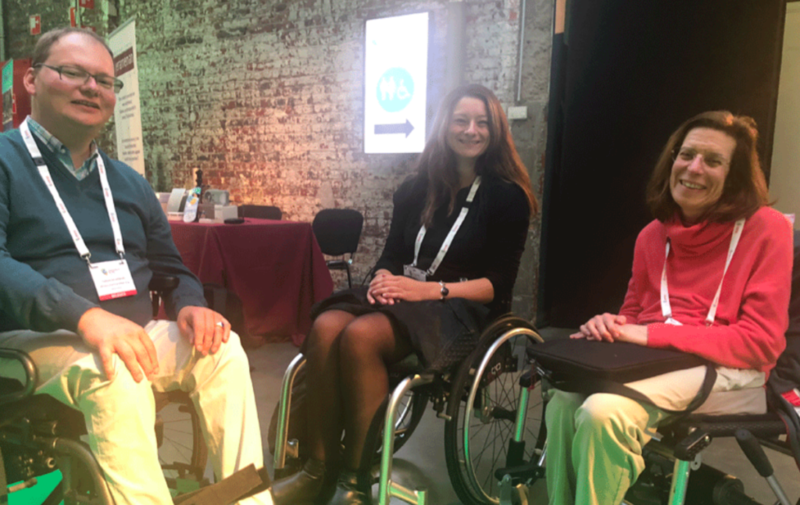 Tobi and I got motivation boost – to see so many passionate people on wheelchair travel and that together we will reach more to travel this beautiful planet of ours and make it more accessible for everybody! Join the team.